Tracks of the Polar Bear!! A mighty polar bear came close enough to sniff us; we no longer run dogs during the day; we have sun rashes, and for a couple of days, we have been playing relay with a French dogsled team. It has been an exciting week!! Since we left Taloyoak we knew there was a French team ahead of us doing who were on a dogsled trip in this area, but we didn't expect to see them. Well, Tuesday Cola who was running in lead on Paul’s team picked up their trail. We had been told by the locals in Taloyoak that this team planned to travel a couple of hundred miles north, so once we were on their trail we thought, “Ha! we have a trail to follow now as we expected they would go pretty much the same route as we planned.” Except for a few detours, and surprisingly enough, within the next 8 hours we passed two of the camp sites they had made. At the end of that day’s running, we reached their 3rd camp site where they were in their tent - eating! It turns out two of them Pierre and Frederic Vernay are from France and the last guy, Franquis Saumure, is from Quebec. They are all traveling with Franquis one team of dogs. 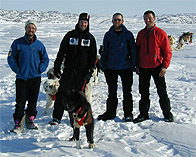 They have picked up 3 Inuit dogs, but most their team is racing style dogs. They are a little smaller with thinner coats than our Polar Huskies. One person has to ski out in front of them, so it goes a bit slower. Traveling 6 hours a day, they cover 20 km (12 miles) but they travel from 7 at night till 1 o'clock in the morning, so the last couple of days we have been playing relay with them. They would take off in the evening to cover 12 miles, we would catch them at their new campsite for our lunch (which we enjoyed chatting with them in their tent). We would travel another 12 miles set up camp, go to sleep, and then they would catch us and set up a camp a little ways from us. It's been fun (also for the dogs) to have some company for a few days. They are great guys. They might catch us again tonight as we are enjoying a rest day today, but it is pretty windy today so it will probably delay them a bit. Tomorrow, that should be the end of the chase, because we will take off for good traveling with our normal mileage so they won't catch us again. Today we got up at 2 am, and as you can see peeking out the tent door it was light and bright outside..
We are actually leaving camp at midnight now. Since the dreaded Monday earlier this week where it was so warm and wet, we have been working on changing our schedule over to night running. We have been sleeping a few hours less every night this week to take off at 5 in morning. Tuesday we left at 3 am Wednesday and then Friday at midnight. We then planned to travel everyday from midnight to 8 am. That means we will get up and eat breakfast at 9 pm, eat lunch at 4 am and dinner at 9 am!! So after Friday’s chat (in the Heroes & Dreams Collaboration Zone at 1.30 EST) we will actually hurry up and go to bed. Pretty weird eh! The hardest part is figuring out what to call each day since we get up on one day and go to bed on another day!? Mille thinks it is fun because now she is on the same time schedule as her family and friends in Denmark. Even tough guys have to remember to put on sunscreen! The dogs seem to like it a lot too. At first, they thought we were nuts hitching them in front of the sled at 3 in the morning, but it is much more comfortable for them. It just gets too hot during the day. The temperature difference between night and day is kind of mind boggling. The other night it was -25 C (-15F) at 3 am and -6 C ( 20F) at 3 pm!!! Think about that. What is the temp difference between night and day where you live ? As you might recall we talked about a couple of weeks ago that the rising temperatures are caused by the sun being above the horizon on the sky longer and longer every day. It is already light around the clock, but we do still have sunset and sunrise, though in a few more days, the sun will be up 24 hours a day making it very powerful. Yesterday, in the middle of the day, it was 20 C (72 F) in the sun! Traveling in these conditions we have to be very careful not to get sunburned and blisters. When you damage the skin like that you, in turn, become extremely prone to heat rash when you cover it up and to frost and wind bites when leaving it exposed because the skin has become so sensitive. Mille has actually developed a sun rash on her right hand, running without a glove on that hand for an hour or so, because it was so hot. But much worse, her lower lip got all sun blistered and infected, making the it swell up. We have been using sunscreen everyday on the trip, but now we put it on several times a day - almost every hour on the lips. Mile is now using sun block 45 which has a very special "beachy smell" and it makes us think of sand, palm trees, and ice cream! The dogs will need sunscreen pretty soon, too! Spank, Polar, Charlie, and Spook are all getting “peely” noses from the sun. This never use to happen. The first year we saw it was in 1995 on the North Pole expedition where most of the dogs got it, and some even quite bad - so the team did use sunscreen on the dogs noses. That year it was explained by the fact that the team was traveling right below the hole in the ozone layer. We know that should not be the case this year as the ozone hole should not be over any human populated area yet, but we wonder if there is a thinning above us? Actually, you can test it on the website. If you go to the Polar Husky Sunscreen page there is a ozone calculator where you can plot in our position and check out how the ozone layer is doing above us. You can also check out how it is doing where you are living! That might be good idea before you run out in shorts and short sleeved shirt - make sure you have on enough sunscreen too! Even Spook who earns the Polar Husky Star of the Week got sunburned on his nose!! Spook is one of the hardest pullers on Mille's team. Very strong minded and a smart guy he has a high position in the hierarchy of the dogs but he is still submissive to his brother Spank. The dogs who have the hardest time with hot sunny days were the big furry brothers Spank and Spank. Spook has the thickest coat right now, and he was just way too hot to pull in the afternoon. He tried hard though, so finally, Mille unhitched him so he would not overheat. But he earns a glittering Polar Husky star for being such a hard puller... no matter the temperature. Timber is a close second, however, as he took care of a polar bear!! We were traveling along the coastline and passing by some islands. We had been told by local hunters that there was bad ice and open water around the islands so we should travel near the shore and cross up and over a point of land instead. They also told us the islands were known bear country. Paul was in the front with the brothers Choko and Aksel in lead keeping an excellent speed. Mille’s team with Nuka in lead was actually having a hard time keeping up. Getting closer to land Paul got this feeling. He stopped to let Mille’s team get closer, then he moved his team to run up just to the higest part of the point we were crossing, and there he stopped to carefully survey the bay ahead for any movement. Sure enough, all the way to the right up against some large cliffs was a polar bear. It was walking head down sniffing the ground, obviously just strolling around looking for something to hunt. The dogs did not see the bear. Paul told them to lay down while he took his skis off, secured the sled, and found the binoculars while yelling "BEAR" to Mille who was approaching. We stood and looked at it. It stopped, put its head straight up in the air sniffing - us. Paul was looking in the binoculars for any cubs while Mille was telling the dogs to be quite. If it is a mother with cubs, she might feel threatened by barking and possibly attack; whereas if it was a male, we would want to make as much noise as possible to make him think it would be less trouble to avoid us. 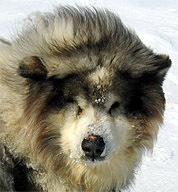 Polar bears are not afraid of people, but as the Inuit always tells us - they respect dogs! No cubs in sight, it was a male and it was heading our way. At the same time, Timber had enough of waiting around and started barking, we encouraged him more and his barking got stronger, the bear stooped dead. Turned 90 degrees on a dime and headed up into the cliffs. It was incredible to watch the power it could move with - especially knowing it was now going the right way, heading away from us. Timber had proved to be a solid bear "scare" dog and got a big hug! We expect to see more bears as we are now seeing more seals laying on the ice sunbathing and we make sure we make lots of noise coming around points of land so we don't surprise a bear hanging out..but we feel a little bit better now as long as Timber keeps the noise level up!